Could Aaron Altherr's hot bat force Mackanin to get more creative with Phillies lineup? 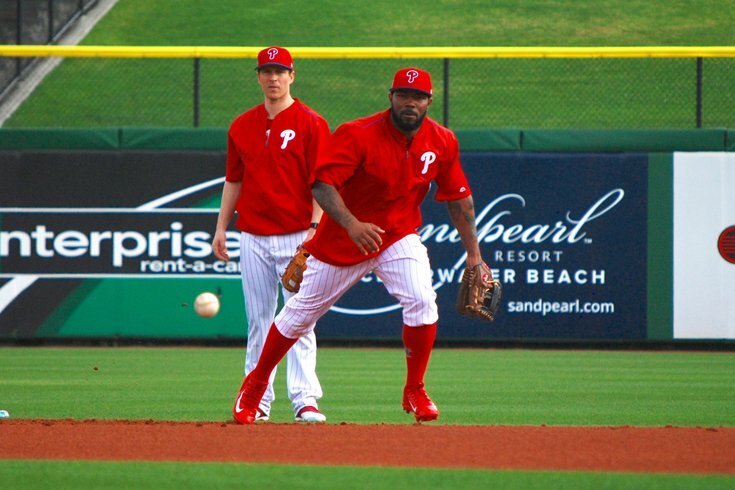 Howie Kendrick made his first start of the spring at second base on Tuesday. Could he see more time in the infield in 2017, despite being added to the roster this winter to be the team's everyday left fielder? CLEARWATER, Fla. – Odubel Herrera was scratched from Wednesday afternoon’s lineup against the New York Yankees for precautionary reasons. Herrera, who spent the weekend traveling back from the World Baseball Classic and then rejoined the Phillies on a day they spent five hours on a round-trip bus trip to and from Fort Myers, Fla., had cramping issues related to dehydration. He’ll go through a regular workout in Clearwater and rejoin the lineup on Thursday. But Herrera’s absence from Wednesday’s lineup was the gain of the hottest hitter in the Phillies clubhouse: Aaron Altherr. We wrote a good bit about Altherr as the forgotten man of the outfield this spring (not one of the veteran newcomers added this winter, not among the crowded group of premier outfield prospects at Triple-A) the other day. He was in line for a regular starting job last March but suffered a wrist injury that robbed him of that opportunity. After working with new hitting coach Matt Stairs to alter his stance and swing (again, that’s in the story from the other day), Altherr is doing his best to force manager Pete Mackanin’s hand to get more creative with the lineups he’ll be writing out in the coming weeks. Altherr is slashing .302/.388/.605 in 43 at-bats in 17 games this spring. His bat has been particularly in gear in the last week: 5-for-12 with two home runs, a double, and five RBI. So what’s the best path to making sure the 26-year-old Altherr gets somewhat regular playing time in April? Because that should be a priority for a rebuilding team that’s still waiting for its aforementioned outfield prospects and should be more important than running Howie Kendrick and Michael Saunders out to the outfield six or seven days a week. A straight-up platoon with Saunders would seem to make some sense, but, again, we looked at that a bit the other day. Given how traditional managers tend to be, whether or not the numbers make sense doesn’t mean it’s not an option for Mackanin. Another option: why not consider using Kendrick as more of a super-utility starter, like how Joe Maddon used Ben Zobrist in the second half of last season with the Chicago Cubs? This probably would not be something Kendrick would be thrilled about. The lack of a regular role was a big part of the reason he soured in his final year with the Dodgers in 2016, eventually asking for a trade at the end of the season. Kendrick was brought in to be the Phillies' regular left fielder. But, with just a one-year commitment to the veteran and those aforementioned prospects (Roman Quinn, Nick Williams, etc.) one step away at Triple-A, the Phils don’t necessarily owe Kendrick anything, particularly if he’s not producing. Spring training stats are spring training stats, but: Kendrick is slashing .184/.200/.265 with two extra-base hits, 10 strikeouts, and one walk in 16 games (49 at-bats). It’s worth noting that Kendrick, a former long-time second baseman with the Los Angeles Angels, made his first start of the spring at second base on Monday in Fort Myers. “He looks like he never lost a step at second,” Mackanin said of the 33-year-old Kendrick. Mackanin said he also planned on to give Kendrick a start at third base in the coming days. So could Kendrick be that Zobrist-type piece for the Phillies, a regular in the lineup without a regular position? Still, if Altherr continues to hit, it’ll be interesting to see how Mackanin juggles his outfielders when the regular season gets underway in two weeks.